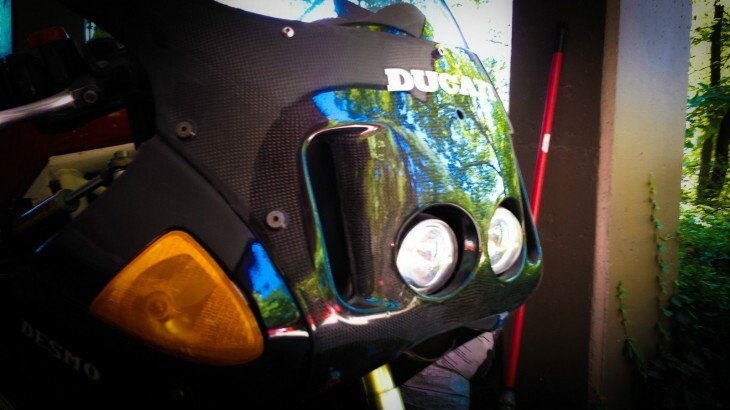 Back in the late 1980's/early 1990's, Ducati was turning things around. 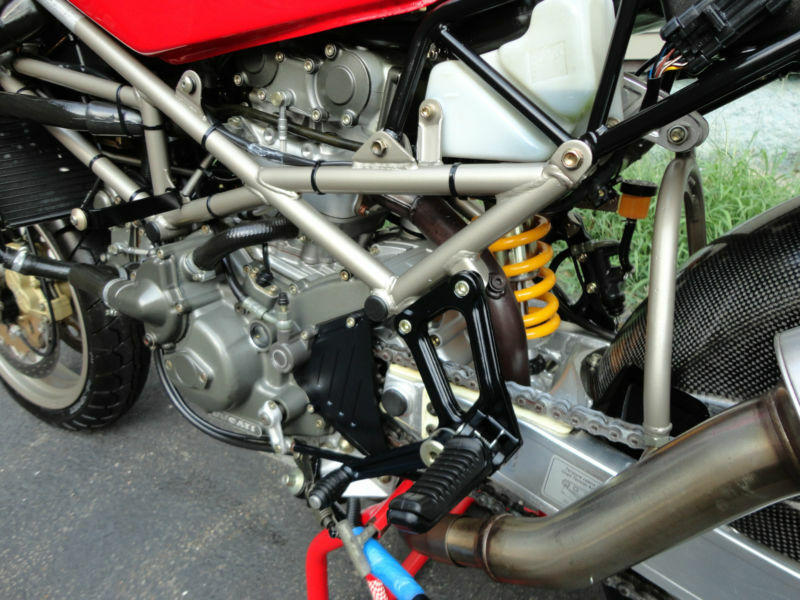 The bologna-based company had developed its 851 engine back in 1987 and the fuel injected L-twin engine was powerful, reliable and had brought Ducati something it had not had for many years; racing success. 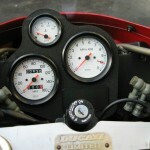 But the Ducati bosses recognized that even though their 851 machines were doing well on the track, something more powerful was needed to keep pace with the competition, especially since the big Japanese firms had decided to focus development on not only power but also improved handling and light weight. 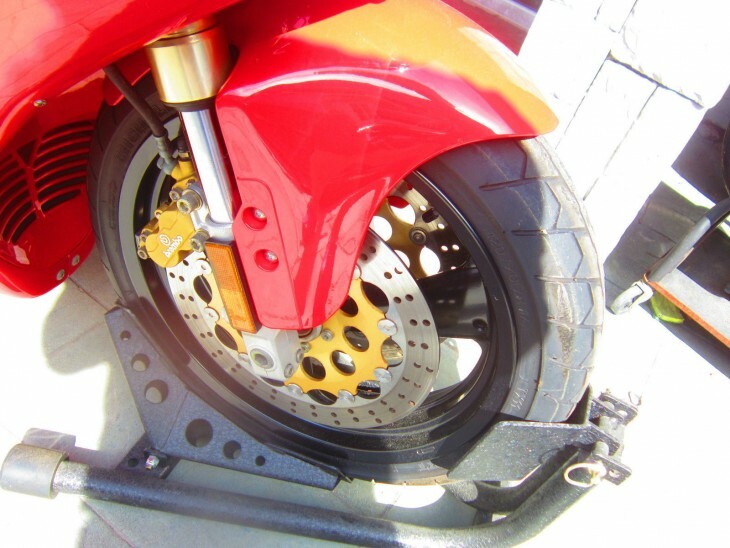 The simplest solution for Ducati was to increase the bore size to 888 while working on their next gen bike, the epic 916, hence the Ducati 888 series was born. This post is for a SPO version, which was the 1993 edition (the 1994 edition was designed as the 888 Limited Edition). NOTE: For 1994 the 888 got even more top shelf goodies and was named the 888 Limited. 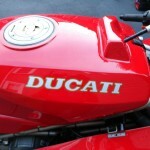 According to the Ducati forums, only 100 888 Limited editions were imported for the US market. "By far the best were the Öhlins-kitted SPs, culminating with the best-of-the-bunch SP5 in 1993. 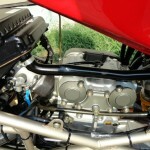 But like anything exotic and Italian, getting the best out of an 888 requires experience, knowledge, patience and money. 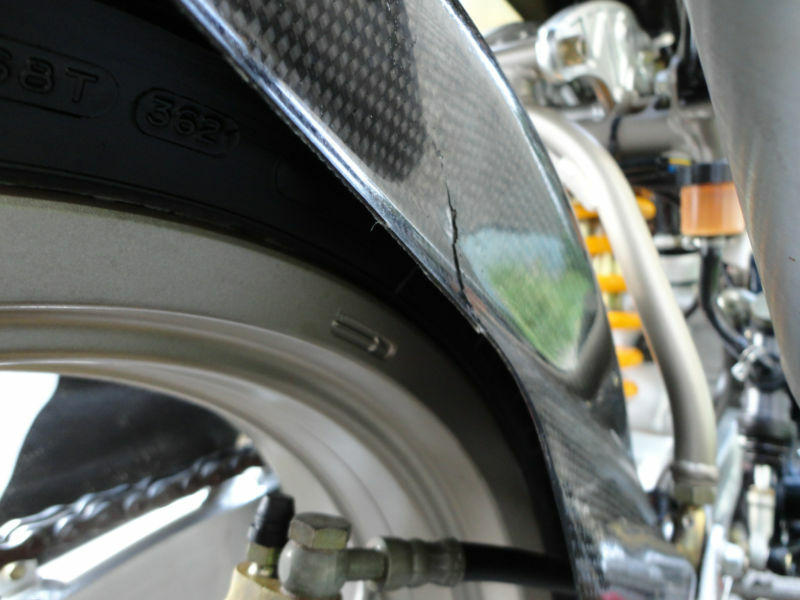 The factory's base suspension settings were all over the shop making a good 888 class-leadingly stunning and a bad one worse than a poorly rebuilt write-off with flat tyres, square wheels and a chocolate frame. This particular 888 looks to be in great shape with the only non-OEM item I am seeing being the tank scratch/bump pad. Also I think the rear license plate mount might have been cut down a bit/"profiled". 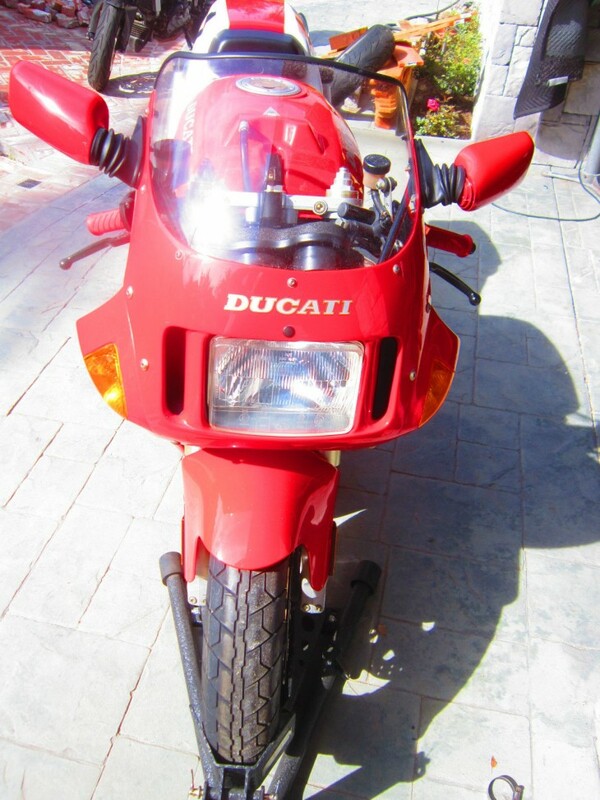 For sale is my beloved 1993 Ducati 888 Sport Production (h)Omologation (SPO). Maintained to be a daily driver but only used when sunny and dry. Factory original bodywork and never been dropped or repaired, every switch and lever works as intended from the factory. 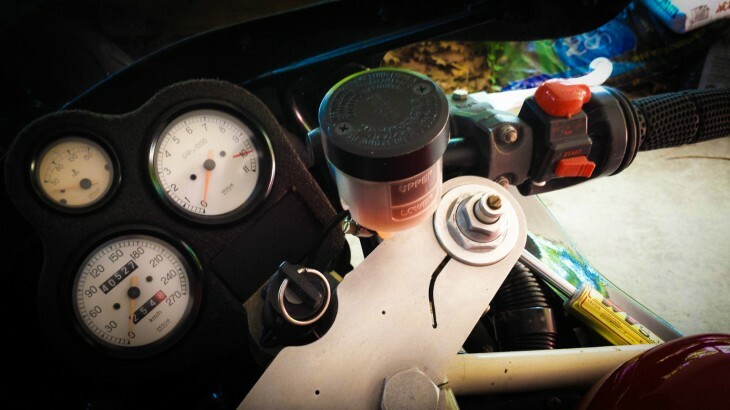 Belts, timing and all fluids serviced within the last 1000 miles. So what is this lovely redhead worth? The entire 888 series is pretty rare, with slightly less than 400 brought into the USA over the two year run, so its going to be of interest to both investment-oriented collectors and fans of the period. The near OEM condition of this will also likely impact the price. 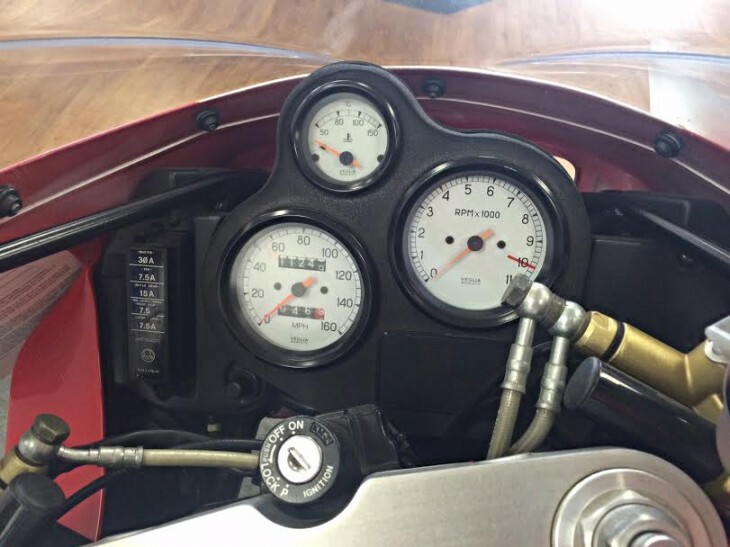 The only concern would be that mileage is about 16,000 which can be an issue if the bike hasn't had proper maintenance but the info provided by the seller should make this one has been taken care of. 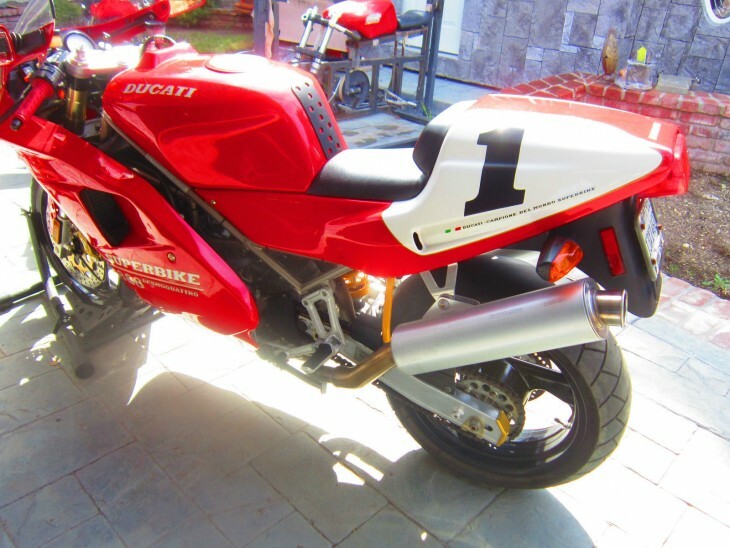 Prices for the Ducati 888 SPO's and Limiteds we have posted previously on RSBFS seem to show a current market value of about $10,000 USD, more for bikes that have had some upgrades. The current bid price on this one is at $7,300 USD and the reserve has been met so this one will definitely be moving on to a new owner after the auction ends. 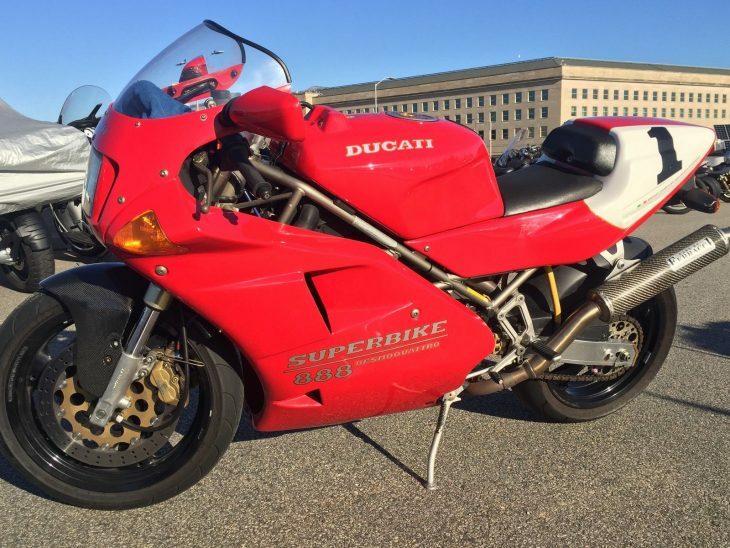 Overall, this seems to be an opportunity for a relatively safe acquisition of a limited edition Ducati that will probably appreciate over time. For the 1991 World Superbike Championship, Ducati made a small increase to the bore of the modernized 851 engine, and introduced the 888. 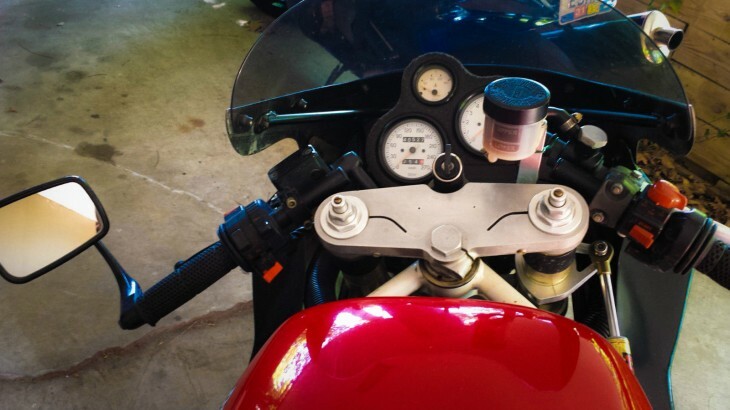 Capitalizing on the 4 desmodromically actuated valves per cylinder, fuel injection, and water cooling in the 851, the bike brought Ducati the 1992 and '93 WSBK championships under American Doug Polen and the AMA Superbike championship in 1994. It was homologated for the 1993-94 model years, with around 300 SPO's being sold in the U.S. in 1993, and only 100 in 1994. A brilliant performer, the 888 has 104 hp and 59 ft-lbs torque available, transmitted through a 6-speed transmission. 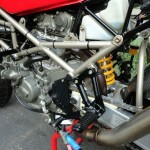 Fully adjustable suspension front ( Showa ) and rear ( Ohlins ), and big 320mm brakes ( Brembo ) complete the controls. The beautiful monoposto bodywork has air intakes either side of the headlight, and a large number 1 on the tailcone. Known as the Strada overseas, these bikes were as much a WSBK as was available. Original 1993 spo .....purchased new and stored under blankets since 1997...this bike has not been started since 1997...parked and left under a set of blankets. With incredibly low miles, some new seals, belts, and tires, this 888 SPO would be a rare sight street or track. 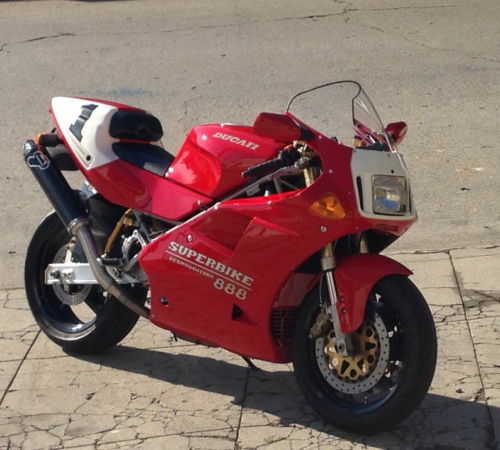 The Ducati 888 SPO is a bit of a hidden jem, no doubt due to the bike that came right after it, the 916. Only produced for two years and specific to the USA, the 888 SPO was a limited edition of the 888 – only 390 were produced. 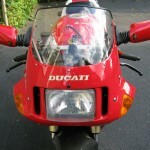 NOTE: 1993 was the first year the bike was introduced and saw a total a total of 290 built that year for the US market. A further 100 were made in '94 with some subtle changes. The 1993 model was known as the 888SPO, while the ’94 was technically known as the 888LTD. 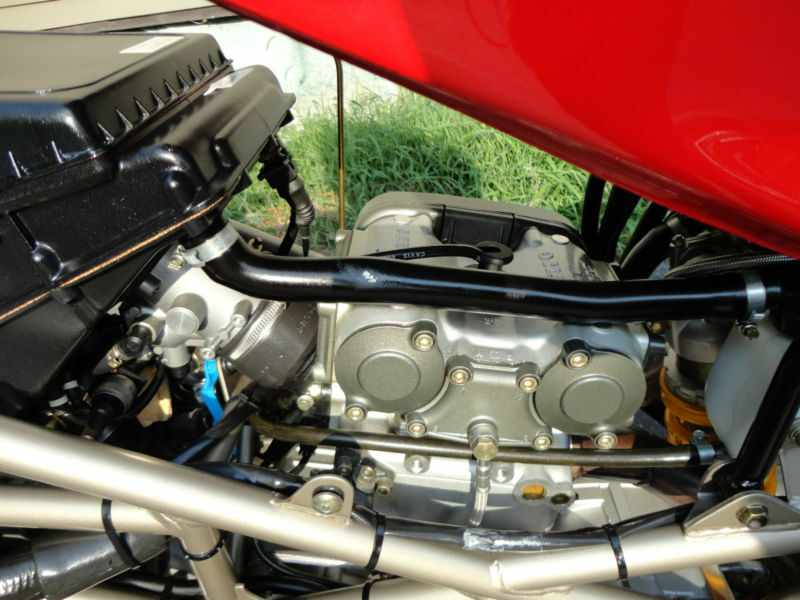 Featuring the trademark desmo valve V-Twin, the 888 SPO/LTD series produced 94 horsepower and were very much suited to track time. Though road legal, the riding position is what one would call “committed”, and they weren’t friendly in traffic. 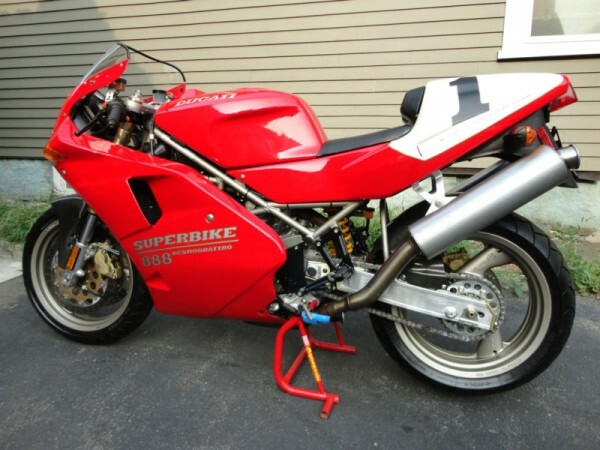 For a limited edition Ducati, the 888SPO seems to gets less mention as a desired collectible than the mass produced 916. 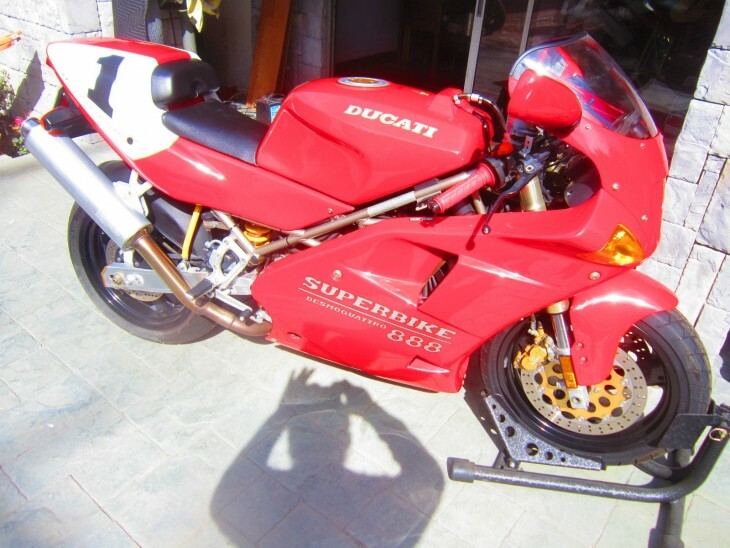 Personally I think this is beautiful bike and given that it was used as the basis for bikes that won both the World Superbike and AMA Superbike championships in 1993, it should certainly be part of any Ducati fans collection. 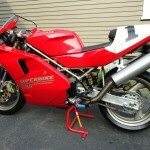 For sale an amazing Ducati 888 SPO with 11000 original miles. the bike is mint and very well taking care of. Recently serviced for over $2000 by Pro Italia. 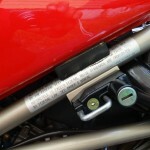 NOS original Termignoni just installed as well. So what's it worth? Well maintenance for this bike seems to have been done but I would still try to find out info about belts and any head and/or base gasket leaks. Back in July a SPO with 712 miles was listed on RSBFS and that went for 16k USD so the asking price of this one at 15.5k is pretty much spot on . While mileage is higher, its for sale in California which tends to bump up the price a bit. All in all, this seems to be a good option for a west coast collector to acquire a 888 SPO. 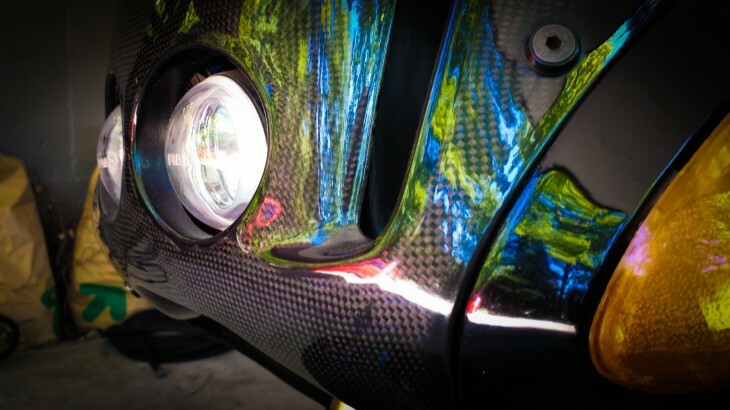 Motorcycle Designer Pierre Terblanche is a somewhat controversial figure in the world of motorcycle design. 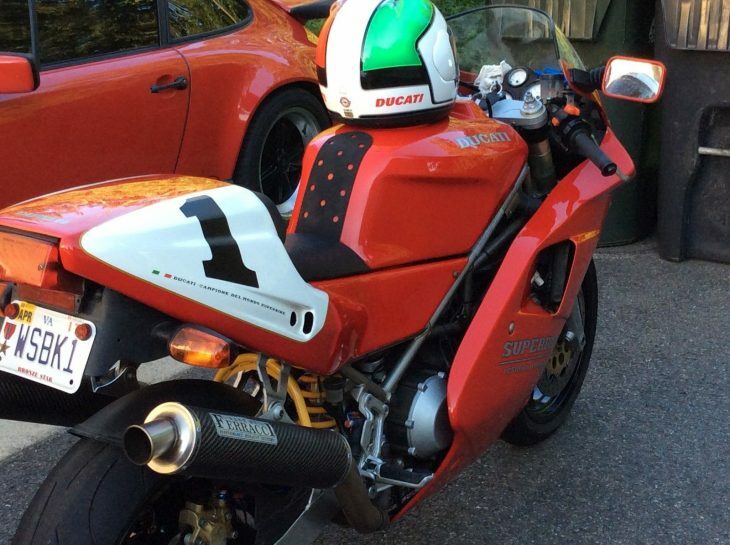 Notably held responsible for Ducati’s controversial 749/999 bikes and Sport Classics, you’ll find a great deal of internet hate directed at him. 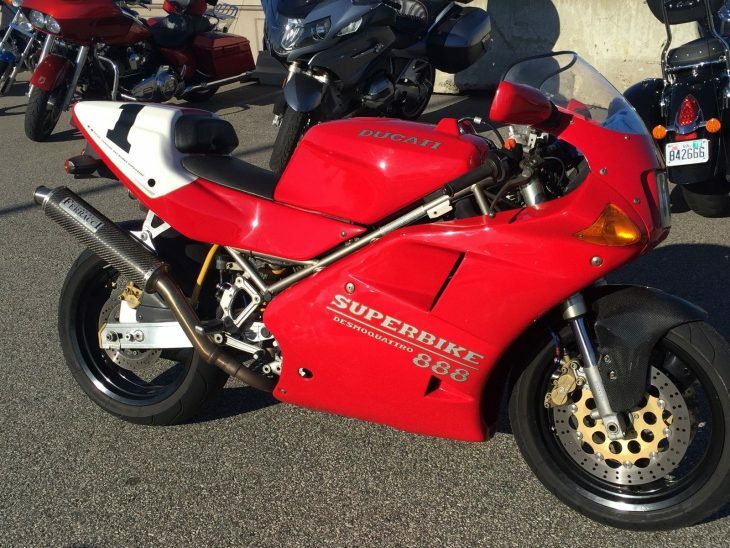 I happen to be a fan of the 749/999 bikes but I acknowledge that they’re not especially pretty bikes. I expect that they’ll eventually be recognized as classics in their own right, and they are certainly more humane and useable bikes than the notoriously uncomfortable 916. However, many people who are highly critical of his designs forget that he was also penned the innovative Supermono and was also responsible for the 900SS redesign, along with the 851/888 bikes. 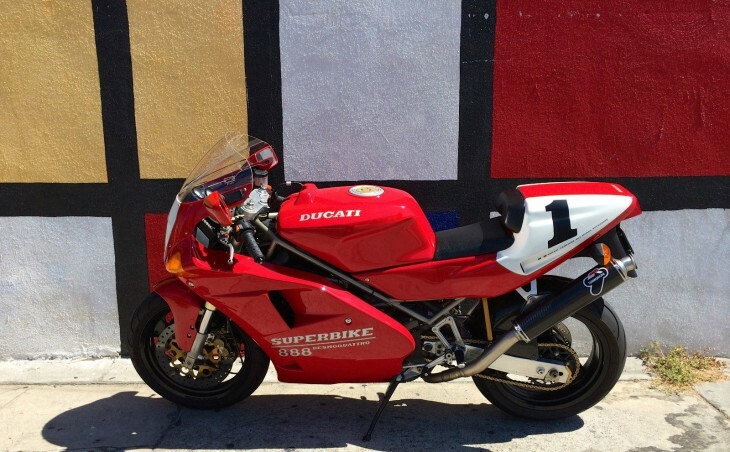 The Ducati 851 is obviously not as iconic or as elegant as the later 916, it’s also far less common, and has a very simple, purposeful look that suits it. Setting the stage for Ducati’s modern superbikes, the liquid-cooled, fuel-injected, four-valve 851 displaced, perhaps surprisingly, 888cc’s and made just over 100bhp. 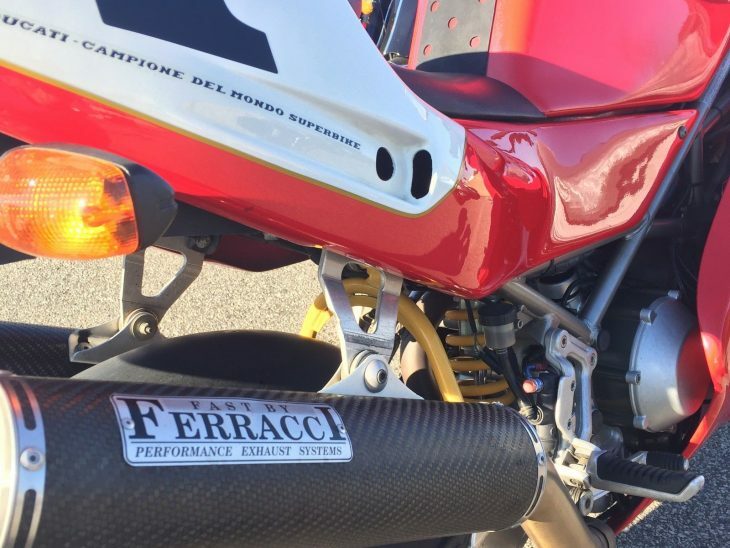 Not all that much in today’s terms, but those 104 horses came with a flat wall of torque that shoots the bike out of corners with authority, accompanied by the characteristic musical booming that Ducati fans know so well. Suitable for any museum or private collector or someone that just wants to ride but I recommend a full service and new tires first. 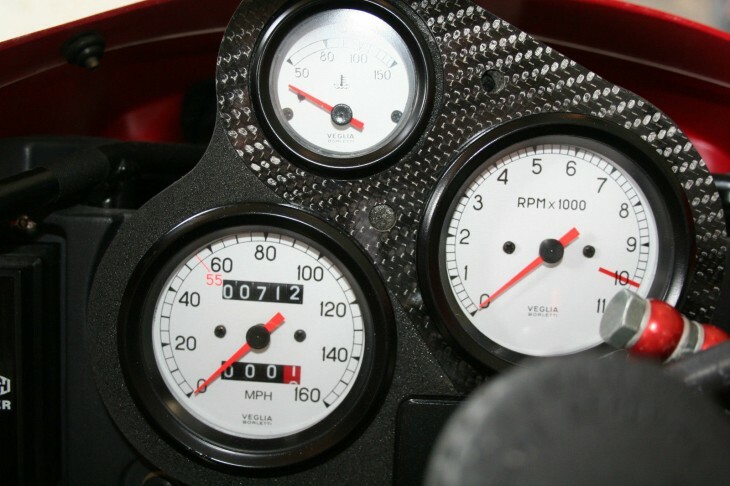 Dials, gauges and switch gear are nice and bright, not faded. Body paint quality nice and clean. 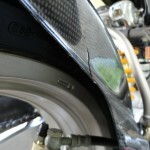 No stress cracks in fibreglass bodywork, never dropped. 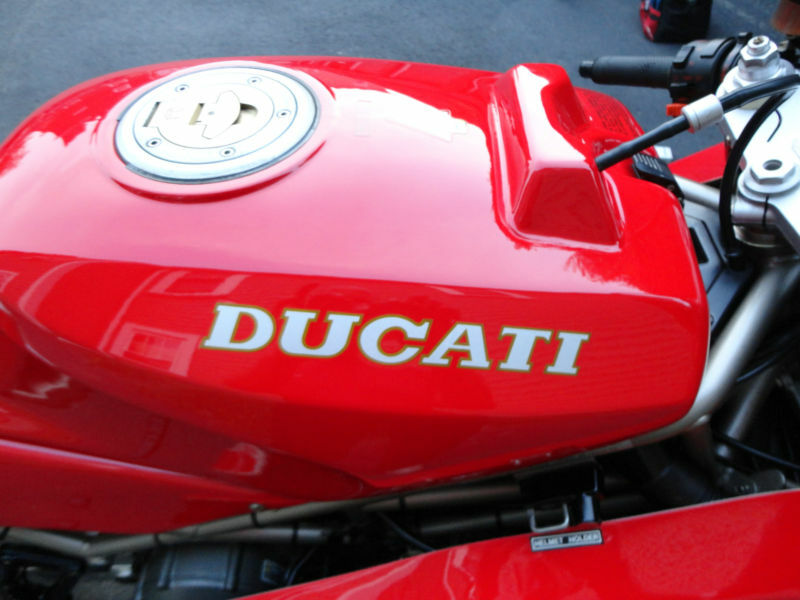 Overshadowed by the Tamburini design that followed, these are still largely unappreciated. 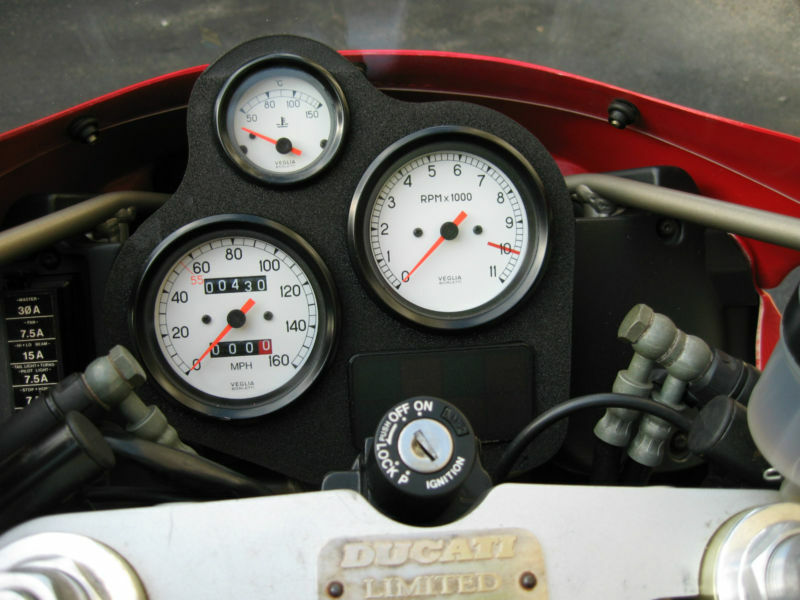 From a historical point of view, the 851/888 represents a huge step forward for Ducati into the modern era with their use of liquid-cooling and four-valve heads. This particular example has a really nice carbon, dual-headlight fairing fitted by well-known California Laverda tuner Lance Weil. It may not be to everyone's taste, but the original parts are included, so it should be very easy to put right. Maybe it’s not the prettiest bike, but one that does the business and is rare to boot. 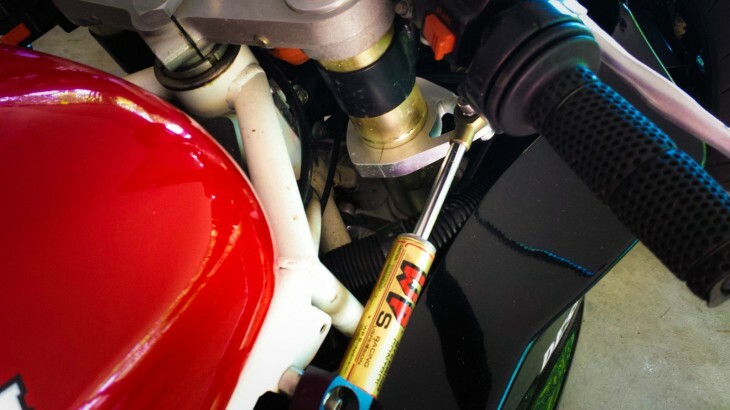 Grab this for relative peanuts, then start scouring the internet for a 50mm Termignoni “spaghetti” full race exhaust for the full, window-shattering experience. Here is a blast from RSBFS founder Dan Crouch's past. 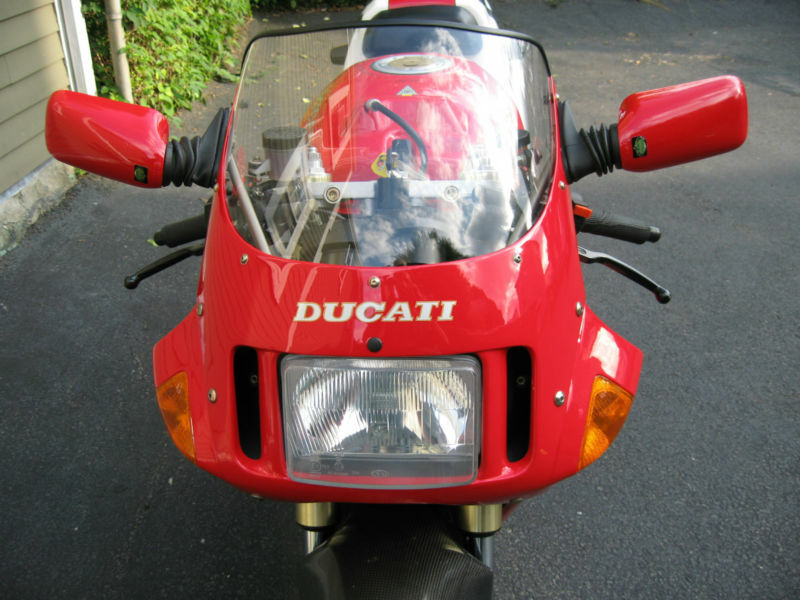 Last seen in July of 2008 on the Dan Crouch Blog (a predecessor of RSBFS) this is a 1993 Ducati 888 SPO with just 713 miles since new. The last of the 851/888 line up before the introduction of the legendary 916 platform, the 888 remains iconic to Superbike fans everywhere. 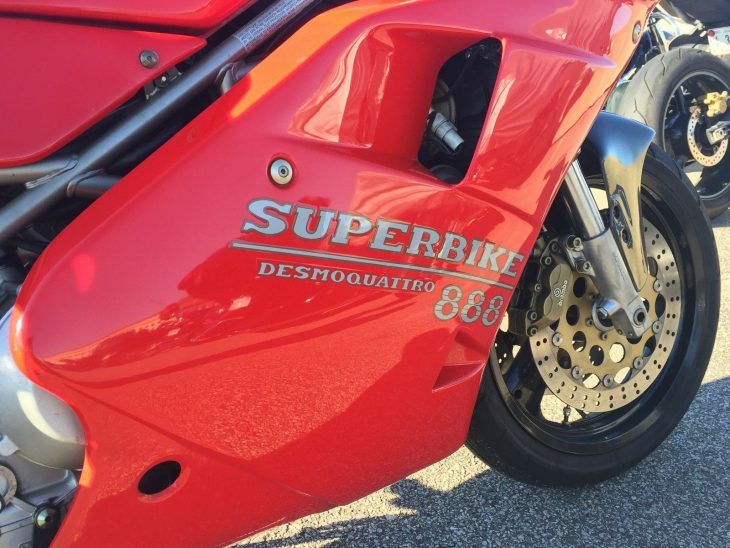 Here in the States, (road legal) 888s were sold in '93 & '94 with the '93 US model known as the 888SPO. 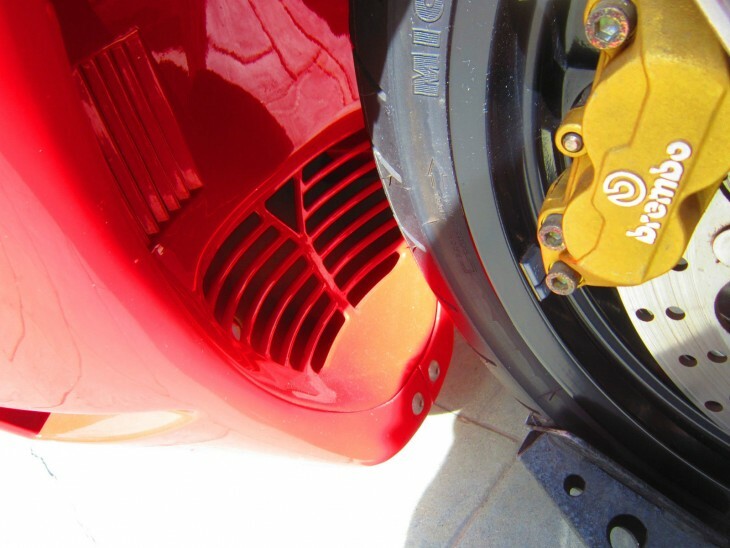 Like a 996, 888s were built with racing in mind and so a prospective buyer would need to look for obvious stuff like head and base gasket leaks. 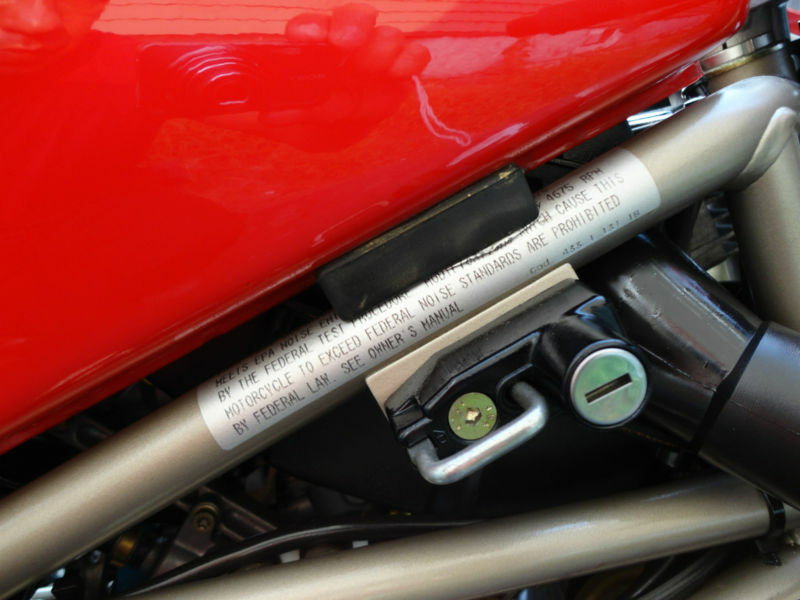 Also, like any other Ducati, a prospective bike would have to have updated & fresh belts tossed in and of course, the same goes for valve adjustments, etc. 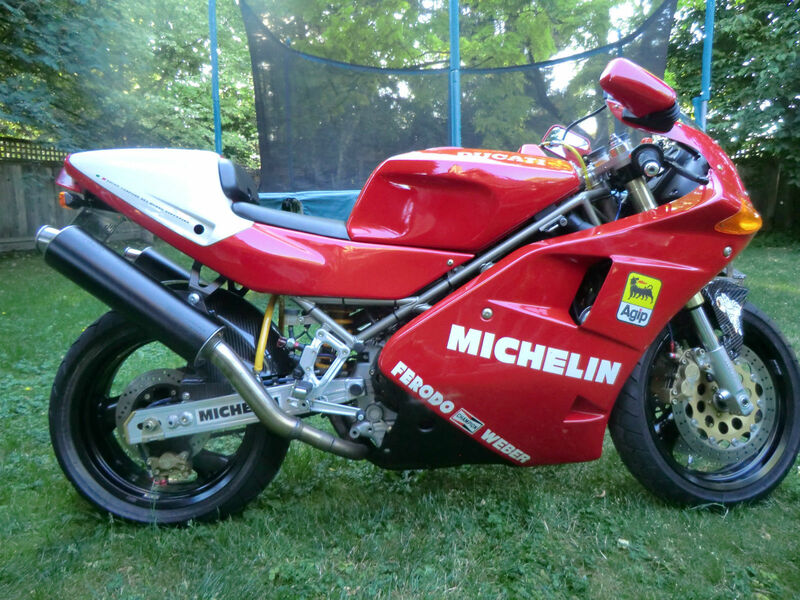 This particular bike has some non-standard graphics but the bike looks exceptionally clean and the seller includes over 100 photos which can be accessed here. 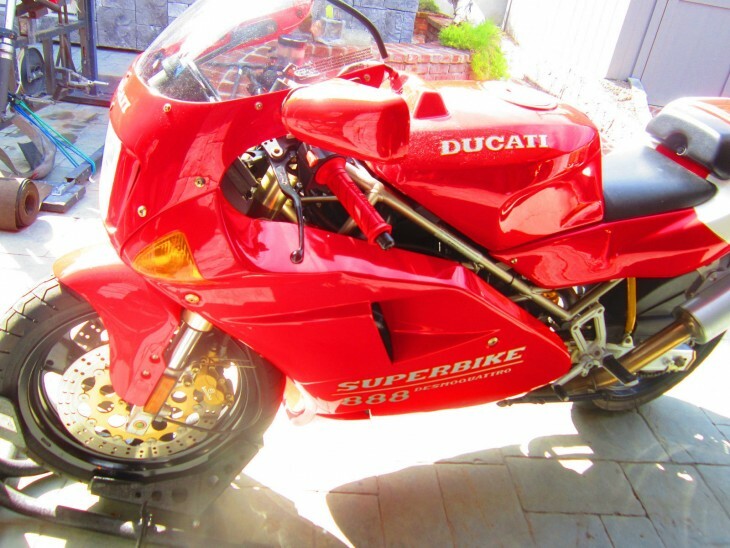 A 100% original Ducati 888 SPO with just 430 miles in Massachusetts. Bidding is almost up with about a day remaining and so far the reserve has not been hit at $12150. The bike has some minor nicks from storage but otherwise it looks clean enough to eat off of. 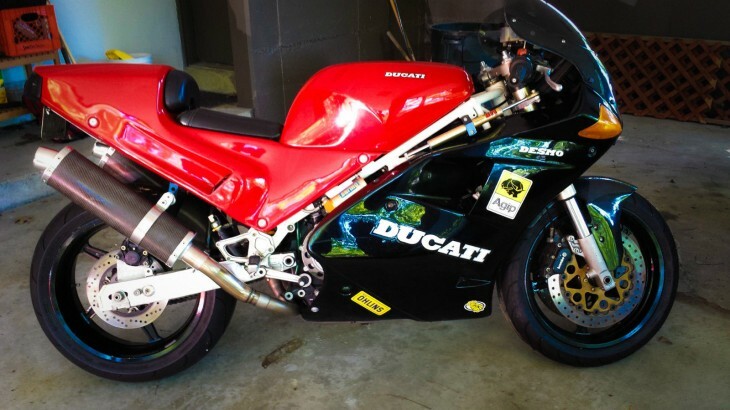 Here is your opportunity to own a piece of Ducati Legendary Racing History, a 1994 Ducati 888 Limited SPO. 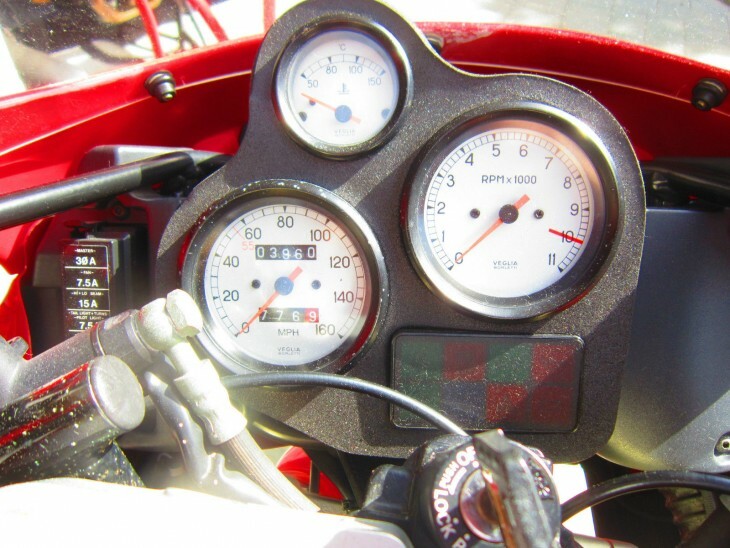 The bike has been in storage since 1994 with only 430 original miles. Yes, you read that right! Everything on this bike is original, every nut and bolt, bodywork, and fluids. Not sure if the bike even had it's first service, but anyone interested in riding the bike will have to do a complete once over. The condition of the bike is near mint, but it does have a few flaws from storage, There are a few paint chips and scratches, the windscreen has a light scratch on it, the rear carbon hugger has a small crack, and the tail section by the seat on the left side has a small crack, and some of the bolts show a little rusting (major ones are by the front rotors), but something that can be cleaned up. I did my best with the pictures to show the small flaws, email me if you want a better view of description of any of them. Even with a few blems, the market is responding with strong money for this one. I'll be very curious to watch the close to see who decides it's worth the extra for the collection. Good luck to buyer and seller!